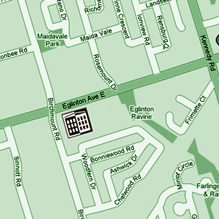 We have two established apartment buildings located at 2231 and 2233 Eglinton Avenue. Conveniently located close to public transportation and shopping areas, surrounded by trees with parks and schools close by. Both buildings have bachelor, 1, 2 and 3 bedroom suites with freshly varnished hardwood floors, brand new fridge and stove and lots of closet space. You are welcome to come and view the available suites call for an appointment! Click on the map to open this location in google maps.